Canada is a major contributor to pharmaceutical and biotechnology research and development (R&D), investing close to $92 million in 2011. According to Andrea Gilpin, director, corporate communications, Novartis Canada, this separates us from many of our counterparts worldwide. “There are over 100 clinical studies going on now in Canada. They encompass such areas as primary care, established medicines, and Phase III and Phase IV studies,” explains Gilpin. “This year, we’re investing in three main areas – protein-protein interaction, biologics, and drug delivery,” she says. Of the $92 million, 76 per cent was allocated to clinical research and a portion was earmarked for pre-clinical research. In a major R&D initiative in Quebec, Novartis Pharmaceuticals Canada has become the latest pharmaceutical company to partner in the Explore program of the Québec Consortium for Drug Discovery (CQDM), which funds small, unconventional and highly innovative research projects that may have an impact on the drug discovery process. Projects funded by Explore must have the potential for a breakthrough discovery that could lead to an important change in the current drug discovery paradigm or conventional wisdom. Novartis has invested $300,000 in the Explore program, joining several other pharmaceutical companies, including AstraZeneca, Eli Lilly Canada, Merck and Pfizer Canada. 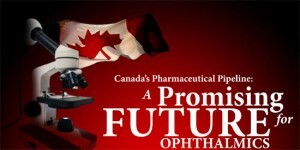 While ophthalmic-related projects are not part of this year’s Explore line-up, they form a significant part of Novartis Canada’s business. “Lucentis is considered to be a key business driver for us. It was one of our biggest products in Canada in 2012,” notes Gilpin. The current indications for Lucentis in Canada are age-related macular degeneration (AMD), visual impairment due to diabetic macular edema (DME), and visual impairment due to macular edema secondary to retinal vein occlusion (RVO). The importance of treating AMD, which typically affects older adults, should not be underestimated in light of Canada’s aging population. Another indication being sought in Canada for Lucentis is pathological myopia, an extremely high amount of nearsightedness that causes an alteration of the shape or globe of the eye and may lead to profound vision loss. In 2011, Alcon merged with Novartis, uniting the strengths of Alcon, CIBA VISION and Novartis. The newly formed Alcon business became the second-largest division of Novartis. 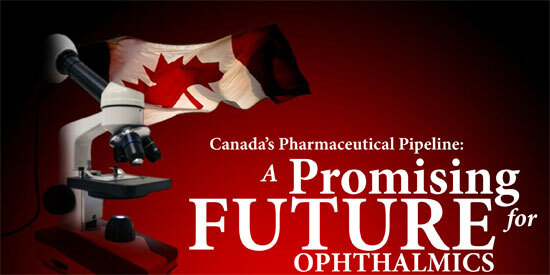 Alcon has filed Jetrea™ (ocriplasmin) with Health Canada for the treatment of the sight-threatening eye conditions vitreomacular traction and macular hole. In October 2012, Jetrea was approved in the U.S. for the treatment of patients with symptomatic vitreomacular adhesion (VMA) and in January 2013, ThromboGenics launched Jetrea in the U.S.
Other big players on the Canadian eyecare scene include Bausch + Lomb, whose widely used Lotemax™ (loteprednol) reduces inflammation resulting from cataract and other types of eye surgery, as well as a number of eye conditions. Allergan Canada markets Restasis®, cyclosporine eye drops used to treat dry eye disease, which is currently considered to be the most prevalent ocular condition in North America. Eye diseases can have a devastating impact on quality of life. Fortunately, new pharmaceutical products are continually being developed to help those affected.